Walking into the warehouse where the NIC TV and Film Crew Training students have put together their set, you wouldn’t know they are a group of students only a few weeks into a program. It looks like any behind-the-scenes photo you have ever seen of a TV or film production site. One of the differences with this scene is that it’s located on the former Elk Falls Mill site. The 44 students, who started the program in Campbell River on Nov. 14 are learning either carpentry and set construction, grip film training or lighting film training. 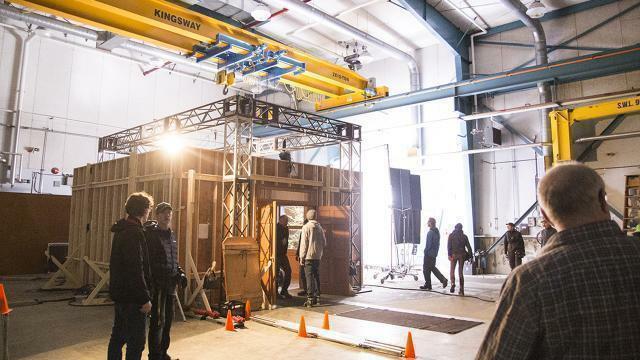 “The exciting part about is is all the students that have done this can now go work entry level in the film industry,” said Hal Keown, carpentry and set design instructor. Keown is one of three instructors who are professionals in the industry and working on the TV series Chesapeake Shores for W Network which is being filmed in Qualicum Beach and Parksville. “It is state of the art technology that those students are being taught, right up to date information,” Keown said. Lighting student, Oliver Wynden, 24, said he has always wanted to be involved in TV and film and this was the perfect opportunity. With access to a local crew like Wynden, Joan Miller, INFilm commissioner, is hoping to attract more productions to the area. For years Miller has seen the lack of local production crew as a barrier to landing contracts but the timing to push for the training of local crew members was tricky. But then came the oil and gas crash, as well as the recent boom in productions taking place in B.C. in recent years. “I thought, gosh, there’s a lot of them out there that are either part way through their apprenticeship or out of work that we could, if we created a short term training program, use in our sector,” she said. The pilot project began with a report to government. Miller interviewed independent production companies in B.C., unions, trade unions and others in the film industry, all who would benefit from local staff trained to work on productions. Last March the government announced $500,000 in funding for the program and from there the TV and Film Crew Training pilot project was born. “It might have been a vision, but it was a vision that people began to buy into and support and here is the result,” Miller said. Miller added that she has seen enormous interested from directors and producers, as well as other film commissioners in the province and around the world. “There is a need for this everywhere,” she said.